Another day, another record made for the benefit of the North-American radio waves, or so it would seem for me at the moment, as I commence my review of this new album from Vertical Horizon, called "Burning The Days". 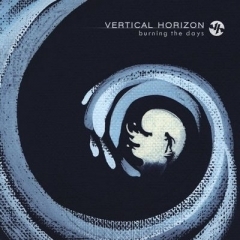 Now apparently, Vertical Horizon used to be a quite established name, having five LP's in their baggage including this new one, and having gone platinum with 1999's "Everything You Want", the title track of which was a huge hit - In the states that must be, because I never heard of it or the band before now. 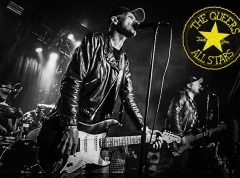 No matter though, that's not what's at stake here, their new album is, and judging from its sound the band is indeed radio rock of the kind everyone should be pretty familiar with. This is of a somewhat more restrained nature than that of similar bands I've recently reviewed, with Default being the only one of the seeming like any just point of reference. Instead, comparisons would probably be more fairly drawn between VH and bands like Semisonic, or even R.E.M, as their rock is considerably softer, with instruments largely providing subtle backup for the singing of guitarist/vocalist Matt Scannel, who wields a voice that sounds very nicely like singers such as Phil Collins and indeed Michael Stipe. While I'm prone to normally talk about how RF.net tends to prefer bands that rock hard, the subtlety of VH's expression is actually a very welcome variation from my recent radio-rock encounters. You see, whenever their songs hit that moment where you would normally expect them to erupt in some predictable, forced, over the top display of strained emotion (why hello Nickelback and Three Days Grace), they usually tend to restrain themselves, relying mostly on an extension of the melodies of the songs, which are mostly very cleverly written. It's the kind of thing about which it would be an injustice to say it is merely easily enjoyable. No, rather it is impossible to not enjoy, because the subtle dynamics are simply skillfully applied in a by-the-book manner that engages the listener and induces good moods, even when the subject matter isn't necessarily the happiest. It's cool, because like most of these radio-rock acts I consistently speak of, most sound like they're grown man's rock bands, but most still cry out with all the emotional despair of someone in their early twenties, and this simply doesn't go for Vertical Horizon. Rather they remain mature, refrain from the outbursts and let simple sense of melody and simple, yet memorable, lyricism do the talking. Still though, this is arguably both a strength and a weakness for them, because however warmly I welcome the maturity and confidence of this approach, the truth is that it also restricts Vertical Horizons from writing the kind of stuff that really burns a mark in your memory. At least as long as they insist on keeping things as simple and straight forward as they do here. Songs like especially "Afterglow", "The Middle Ground" and "Welcome To The Bottom", and indeed most others, have me humming and nodding along, but as simple fixes as they indeed are, they lack the attitude to truly impress. However, rather than selling out and becoming like everyone else, I'd recommend VH to simply up the ambition of the song writing, experiment a little, so that they can maybe end up appealing even more to those of intellect and maturity, who will surely be the ones who are already most likely to be taken in by "Burning The Days".